The owner of the International Inn on Normandy Drive has an agreement, in principle, with the City and preservationists to build an eight-story tower on the property in exchange for not contesting historic designation of the Inn, but the agreement is on hold due to the ongoing legal troubles of the Miami Design Preservation League (MDPL). Those rights include maintaining the use as a hotel, adding a restaurant and bar, and the ability to build a slender tower on the property to make use of the remaining FAR (density) allowed on the site. “The holdup now is MDPL… they were meeting with us every step of the way,” he said. Included in those meetings were Nancy Liebman, in an individual capacity and not as an HPB Board member, and Daniel Ciraldo, the MDPL Executive Director who is now in limbo as two groups fight for control of the organization’s Board of Directors. 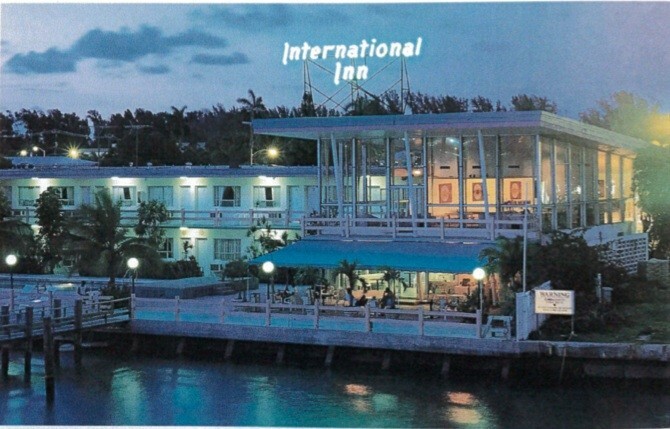 The International Inn illustrates not only how the legal issues with MDPL are holding up what the organization stands for – protection of historic properties – but also how intertwined the organization is with the City’s processes given their special standing within the City Code to contest HPB decisions. One concern is the property’s status as a non-conforming use. It has been a hotel since it was built in 1956 but when the zoning changed in the area to prohibit new hotels, the International Inn became non-conforming. If the owner were to make repairs or upgrades that cost more than 50% of the value of the property, it would lose its grandfathered status and would no longer be able to operate as a hotel. While the owner is not seeking to add additional square footage to the property, the current inn does not fully utilize the allowable FAR. Tachmes said his client would like to utilize the 10,000 square feet of available FAR to build an addition. “One option would be to put the FAR in a manner that… might be a little more squat and would have to be placed, out of necessity, over the historic portions of the building” or by building “a slender eight-story tower on the north part” that would not touch the historic structure. Alan Shulman, an architect highly regarded by the preservation community, prepared several massing studies and came up with the slender tower “that would allow the square footage to be added while retaining as much of the historic aspects of [the Inn] as possible,” Tachmes said. Under the guidelines for designating properties, a formal report on suitability for designation must be given within one year of the process kick-off. Tackett made that presentation and then recommended deferring action on the item for 120 days. In the meantime, the process protects the property from any demolition. While recommending the Board continue the designation to a future meeting, she said, “Ultimately we do believe it satisfies the criteria [for designation].” Staff is in agreement with the owner that waiting until MDPL’s issues are resolved is, for now, the best way to proceed, she said. The HPB does not designate historic sites. It can make a recommendation, but formal designation comes through an ordinance approved by City Commission. Tachmes reassured the Board that the zoning in progress continues. “If she were to sell it tomorrow, the buyer could not demolish it. What you’re doing, to use a legal term, runs with the land. It’s not personal to this owner,” he said. Tackett recommended the item be continued until the HPB’s January meeting. Meanwhile, discussion of the proposed changes to the land use regulations is another item on the agenda for the Commission’s Land Use and Development Committee this week. Before closing the item, Tachmes wanted to put on the record that the vacant lot next to the International Inn property that is “in very poor condition” is owned by the Florida Department of Transportation (FDOT). He encouraged the City to get involved to ask FDOT to maintain the lot. He said his client wanted to buy it but was rebuffed. Liebman echoed Tachmes' concerns. “There are problems because of the lot. It’s a mess. People park cars there. There is absolutely no control over what’s going on there. If the City wants to do something good for this hotel,” they can ask FDOT to “clean it up and perhaps look at selling it so the City has more control over it,” she said. North Beach Town Center: How High and Where?